Trick out your '10-Current Chevrolet Camaro with this tough-looking Side Graphic Kit. Easy-to-install kit is packaged as a set of eight (8) pieces. They're PRECUT and ready to install in a wide variety of colors. Except for slight trimming at the Fuel Door, all pieces are ready for application - NO TRIMMING required! As you can see, this stripe package is not just a set of straight strips in a box. 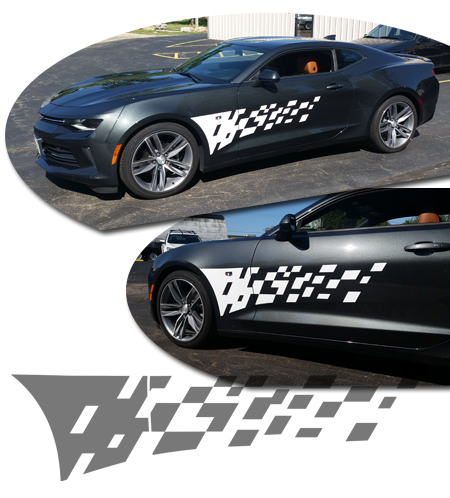 Our graphic kit consists of prefitted and contoured pieces that are specifically made for the '10-Current Chevrolet Camaro per the Graphic Application Chart below and will not fit any other vehicle. Note: Application of graphics may require temporary removal and replacement of existing factory emblem(s). Alternatively, graphic may be carefully trimmed during application.